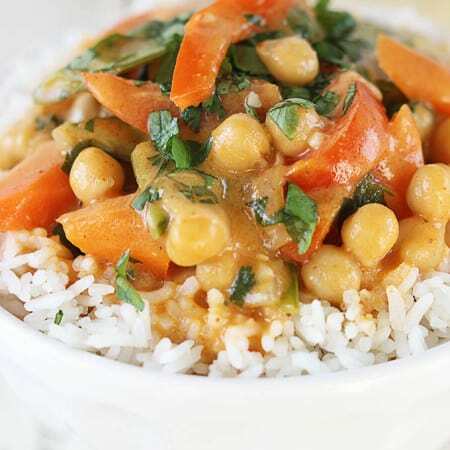 A quick and simple creamy curry dish with chickpeas, veggies, and a hint of coconut! So easy - it's ready in just twenty minutes, plus it's healthy! Add snow peas, onions, carrots, red peppers and oil to a large pan or nonstick skillet and sauté over medium-high heat 5-6 minutes until veggies are tender. Add garlic and cook another minute or so until garlic is fragrant. Add coconut milk, red curry paste, lime juice, yellow curry powder, chickpeas, garlic slat, and salt. Continue to cook and stir until chickpeas are heated through (about five minutes). Stir in cilantro. Taste and add salt if desired. Serve warm over rice and top with additional cilantro. *You may add cooked meat if you prefer a non-vegetarian version. I suggest chicken or shrimp!